An old drug is giving new hope to patients with depression. TAMPA, Fla. — When you have a chronic illness like high blood pressure or diabetes, you go to the doctor. But when it comes to mental illnesses, like clinical depression, it's not that easy. Many people don't get treatment, thinking they can handle it or it will just go away. Suicide is now one of the leading causes of death in the U.S. There are now new ways to treat depression that are starting to give people hope. In the last few years, an old drug is proving to have a new use. "It's like going down a dark, dark, dark alley and it keeps getting darker," Kelly Choi said. "It's desperation. It feels hopeless. It came to a point of crisis. "If you would have asked me 'could I change overnight like that?' I would have told you no." Choi had suffered from depression for years. She had tried everything. It took one shot of ketamine to bring her back into the light. 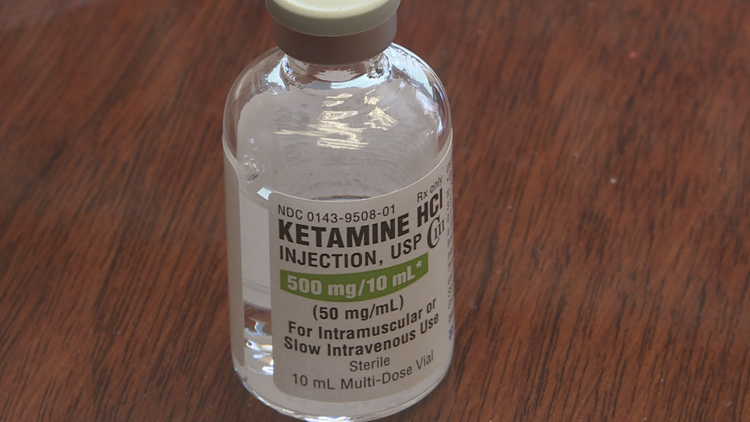 "Ketamine is an anesthetic drug that's been around and approved for 50 years," said Tampa psychiatrist William Dudney. "It's used in operating rooms every day." A few years ago it was discovered that this same drug can have an effect on mood. So, psychiatrists started prescribing it "off label" to people suffering from depression. Dr. Ashraf Hanna at the Florida Spine Institute was one of the first doctors in the area to offer IV Ketamine Infusion Therapy eight years ago to treat chronic pain. He now uses it on patients for many conditions including depression. "Even one of the more recent theories for depression is inflammation of the brain and this is where ketamine came in," Hanna said. "Ketamine is actually the most potent anti-inflammatory to the brain." Dudney frequently prescribes ketamine in the form of a lozenge to his patients. It's something he now offers as an alternative to anti-depressants. Those medications often have undesirable side effects like fatigue, weight gain and loss of intimacy. They take a long time to work, sometimes as many as two to six weeks. Ketamine doesn't have those side effects and it works fast. "It can work in a matter of days or hours which is a huge advantage. In all the decades I've been practicing psychiatry, I've never seen anything where the enthusiasm is so positive and the outcomes are so good," Dudney said. Seven months ago, Choi says she would have never been so open about her depression. "But because this has changed my life so much, if there's one person that would hear this and know that there's hope then I would do it again," Choi said. We want to stress the importance of seeing a psychologist or psychiatrist to either get a prescription for ketamine or be referred to a ketamine clinic. Again, it is prescribed for depression "off label," which basically means it's being used for something other than what the FDA approved it for. It's fairly common for other medications to be prescribed "off label" by your doctor. Click or tap here to find out more about IV ketamine and Dr. Ashraf Hanna. Click or tap here to find out more about Dr. Dudney.